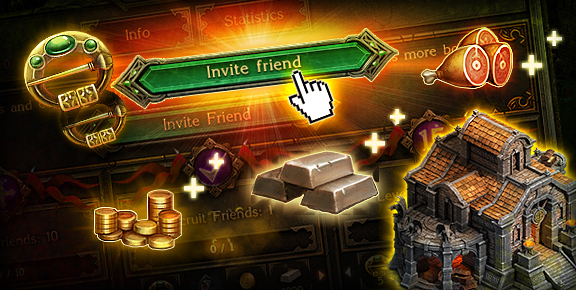 The House of Unity allows you to improve your Iron, Gold, and Food production and earn rewards by inviting Friends. Open the "Statistics" tab to invite your Friends and receive rewards! The more Friends you invite that join the game and that reach Level 15, the bigger the rewards you will receive! Amongst the rewards, you will also find a special item – Tokens. Use these Tokens to upgrade the House of Unity and improve your Resource production. You may upgrade the building to a maximum level of 10, which will provide a 20% increase to your Resource production. 1. Inviting Friends to join the game. Bear in mind that you will only get one reward per player invited – repeat invites will not be counted. 2. Each Friend that joins the game. 3. Each invited Friend that reaches Level 15 in the game. 1. Go to your Castle and click the "Construction" menu. 2. Open the "Resource" tab and select the House of Unity. 3. Choose a place inside your Castle and start construction. Go forth and spread the word of friendship and victory!